Gregarious. Loose-knit herds of up to 20 animals. Males have dominance hierarchy based on seniority. 1. 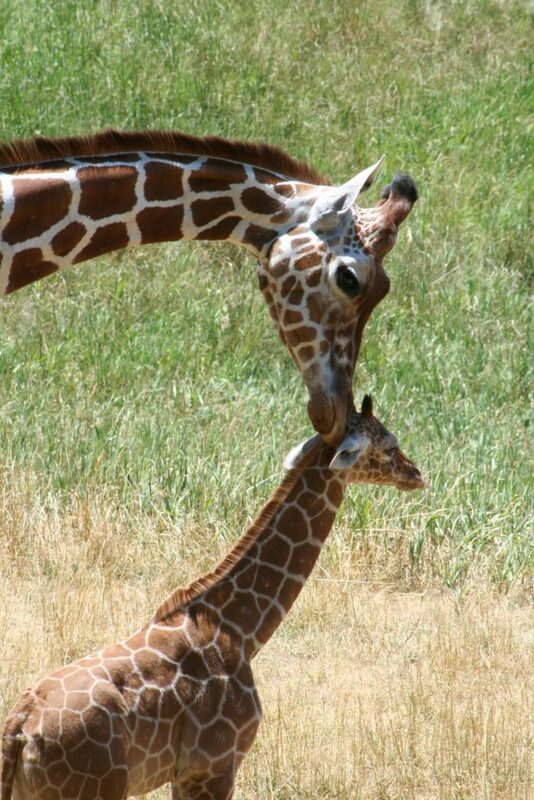 A giraffe’s neck has only 7 vertebrate like most other mammals. 2. The tongue is black and can be up to 18 inches long. 3. Giraffes are poached for meat, skin, and good luck charms. 4. Each individual giraffe has a unique pattern. 5. The heart is 2 feet long and weighs 25 pounds. It beats 170x/minute and has two times the blood pressure of humans. 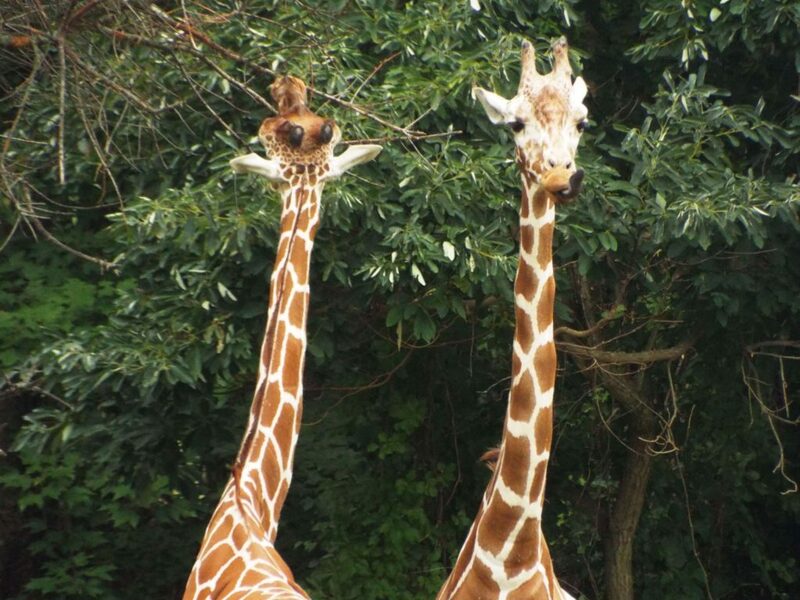 Makena was born August 17th, 1999 at Columbus Zoo and Aquarium and arrived at Binder Park Zoo in April 2005. Standing at an impressive eighteen feet, Makena is the tallest giraffe in our herd and is the only one who can reach guests over the railing at our Twiga feeding deck! She has an amiable personality towards people and her favorite food is fresh sassafras browse in the summertime. 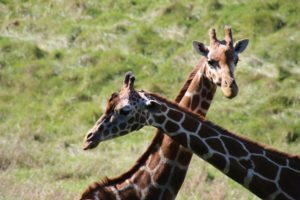 Since arriving at Binder Park Zoo, Makena, whose name means “happy one,” has given birth to four calves: two girls and two boys. 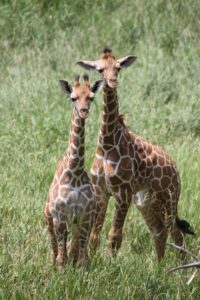 Her two most recent calves, Hulka and Kijana, are part of our giraffe herd and are frequently seen by her side. Aside from her height, Makena is easily identifiable by a white “M” in the middle of her chest. Hulka was born June 16th, 2014 at Binder Park Zoo to experienced mom Makena. As a calf, Hulka was very shy, but he has since formed a great bond with his keepers and is even the star trainer of the herd! Hulka will voluntarily pick up all four feet for hoof trims and also participates in voluntary blood draws if the need arises. Though he is still quite shy around new people and large groups, Hulka is beginning to love visiting the Twiga feeding deck and can be identified by the spot on his right shoulder that looks like a clock set to 9:00. When not at the feeding deck, Hulka can usually be found hanging out with his sister, and best friend, Kijana. Kumi is a male giraffe that came to Binder Park Zoo to contribute to our giraffe breeding program. He arrived in the fall of 2017 and loves his home at the savanna barn. He was born on July 17th, 2015 at the Albuquerque BioPark Zoo. Kumi is very friendly and warmed up to the keeper staff very quickly. He loves to use his tongue to grab enrichment items and food from puzzle feeders. He also likes getting fresh branches of maple, sassafras, and mulberry. Rukiya is one of our adult female giraffes here at Binder Park Zoo. 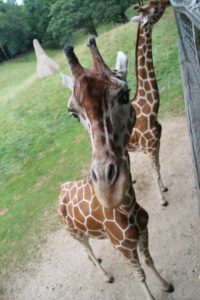 She was born on October 24th, 1997 at the Columbus Zoo and Aquarium. She came to Binder Park in November of 1998. 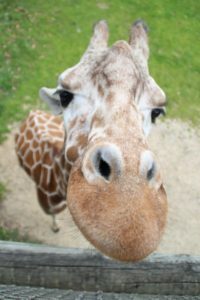 She is the second oldest giraffe here at the zoo and has been here at Binder Park Zoo longer than any of our other giraffes. Rukiya takes some time to warm up to people but once she does she forms very close bonds with her keepers. On exhibit, you will usually see her reaching as high as she can to get leaves off the trees. Some of her favorite trees to browse on are sassafras and maple. 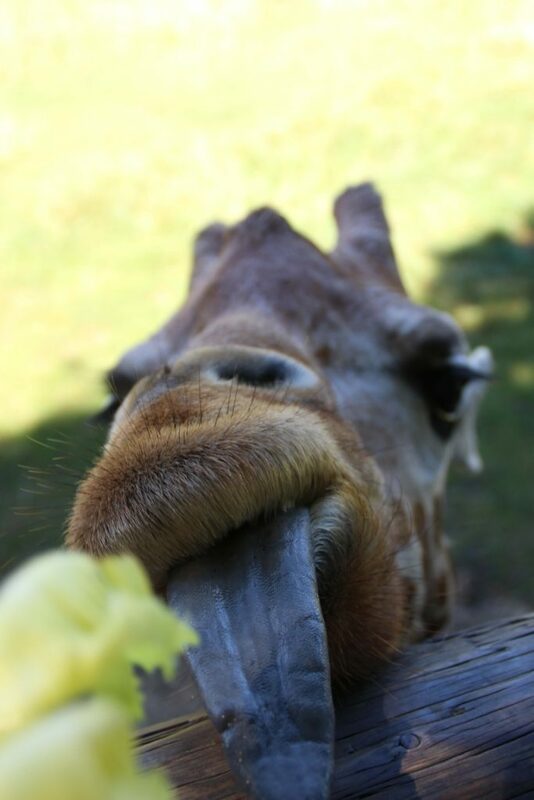 She loves eating romaine at Twiga so make sure you come to the zoo to visit her! Cece was born at Houston Zoo on June 8th, 1997 and came to Binder Park Zoo in May of 1999 when Wild Africa opened. Cece is highly food motivated and is the first one at the feeding deck every morning. She loves to eat romaine, but don’t try to touch her face; she does NOT like that! 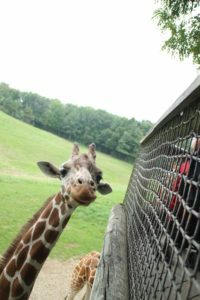 She has a very calm personality and we can always count on her to encourage the others onto exhibit in the summer. 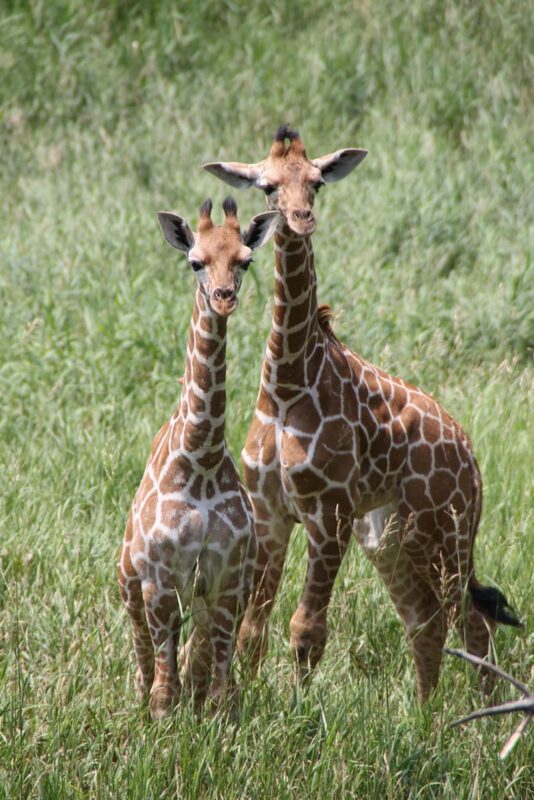 We identify Cece from the other giraffes by her lighter coloring. Her brown spots on her chest have white spots in them. 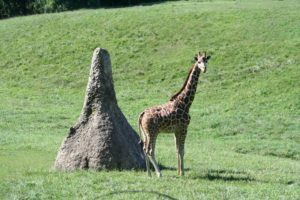 Kijana (Kee-jahn-uh) was born at Binder Park Zoo on May 23rd, 2017. 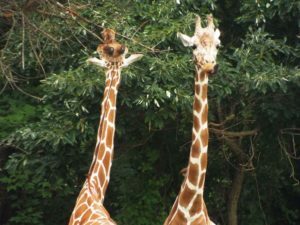 After much anticipation to witness a giraffe birth by keeper staff, Kijana’s momma, Makena, had plans of her own and delivered Kijana overnight with zero witnesses. Kijana is the 10th baby giraffe born here and our biggest one yet. She was born at almost 200 pounds and 6 feet tall. Kijana means Junior in Swahili and was given that name to honor her dad, who passed away before she was born. From day one she has proven to be a strong, independent girl. 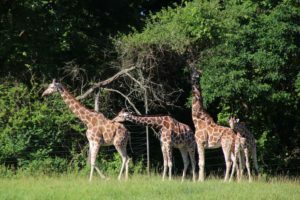 While most babies stick close to mom’s side, Kijana could be seen wandering off to investigate the other animals on the savannah exhibit while mom remained at the feeding deck. For now, Kijana is easy to identify because she is the smallest, but we can also tell her apart because her spots on her chest form a flower.